IMAGE: This is a bed bug feeding. Credit: Gary Alpert, Harvard University, Bugwood.org. 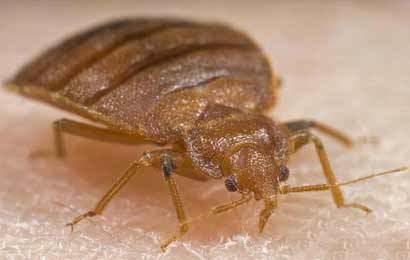 The full article, "Posttreatment Feeding Affects Mortality of Bed Bugs (Hemiptera: Cimicidae) Exposed to Insecticides," is available at http://dx.doi.org/10.1093/jee/tov293. The Journal of Medical Entomology is published by the Entomological Society of America, the largest organization in the world serving the professional and scientific needs of entomologists and people in related disciplines. Founded in 1889, ESA today has nearly 7,000 members affiliated with educational institutions, health agencies, private industry, and government. Members are researchers, teachers, extension service personnel, administrators, marketing representatives, research technicians, consultants, students, and hobbyists. For more information, visit http://www.entsoc.org.